Hello friends. I saw the following wonderful video on the blog called Art of Quotation just now, and it inspired me…again. This link takes you to Doug’s great blog! First of all, I have shared this song “Vincent” by Don McLean on my blog before. The song plays while Vincent van Gogh’s paintings are shown in the background. However, I had never seen one of Don singing and playing the song. I am sharing it because it is lovely. I have always loved his voice especially the way he sings this song in particular. When it came out in the ’70’s, when I was a whole lot younger, I didn’t really know it was about Vincent van Gogh, because I wasn’t interested in art back then nor did I know who van Gogh was! I don’t remember ever learning about artists in school to tell you the truth. I remember doing art in first grade and later in Jr. high, but I never had any good experiences with it back then. I do have vague memories of painting at an easel in Kindergarten which are good. These came back to me when I was taking classes for pre-school teaching 24 years ago and was working in the college’s child study center as a student aide. That job was the best one I ever had! The smell of the paint we mixed for the kids brought back my memories of painting at an easel in Kindergarten! I even remembered the crinkly sound of the paper when my teacher took down our unique creations after they had dried. Believe it or not, she didn’t make us all paint the exact same thing! I don’t remember a whole lot about Kindergarten except a few kids who were in my class. I have a few pictures of them around here somewhere. Isn’t it funny how strong our senses are connected to our memories? For instance, whenever I smell the spice of rosemary cooking on chicken, I remember the first time I ever cooked with it. I was just about eight weeks pregnant, I think, and I had just put the chicken with rosemary and butter on it in the oven. A little bit later I started feeling very nauseated so much so in fact, that I almost got sick. (Sorry) I just lay on the couch and felt like dying. I went outside and walked around a little bit, though, yet I remember how I suffered through the cooking of that chicken! I felt stuck, because I couldn’t go off and leave it cooking in the oven when no one else was home. My husband was at work, and we were living literally paycheck-to-paycheck, so I couldn’t just chuck it in the garbage either! So I just waited for it to finish cooking as I moaned and groaned. My husband said it tasted really great, but I wouldn’t know…I felt too sick to even look at it much less eat it! It’s funny because rosemary is my very favorite thing to put on chicken when I bake it now. Strange, but true. So what does any of this have to do with the song “Vincent?” Nothing much really except to say that whenever I hear the song now, I see van Gogh’s beautiful work in my head. I feel inspired. I feel like someone who lived so very long ago understood where I am at right now even though he had no clue what really may have been causing his troubles. Lately, I have not had any kind of plans for drawing or painting except to paint Sherri’s fox which was a pleasure to do. As soon as I learned of her father’s death and saw the fox on my calendar (which is where it came from, but I have not photographer’s name to credit) I knew I wanted to paint it just for her. Perhaps my own motivation comes when I want to bless others with something meaningful instead of just painting for the heck of it. Not to say by any means that what I do for myself or for fun or for experimentation isn’t meaningful because it is. Time spent on art is never a waste of time. It’s just that when someone (in this case, Sherri) tells me that she cried when she opened her package, that is what made it all worth it. I did have fun doing it, but knowing it touched her heart so deeply is what made it even more worthwhile for me. 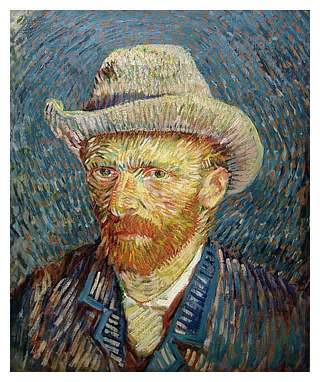 Vincent van Gogh was an emotionally frustrated man, tortured really, by what people think may have been bi-polar disease. I have a right-brained way of thinking myself….creative and packed full of feelings, plus clinical depression to boot, which I take medication for. So I suppose this is why I love van Gogh and his work so much. In the last couple of years I have been reading his personal letters to his brother Theo which I have posted about before, and they do reveal a very sensitive and loving man who just wanted and needed the validation from others for who he was and the work he did. He desperately wanted to be taken seriously! Isn’t that what all of us crave for the work we do? Well, I know I do, so that is why I want to say THANK YOU from the bottom of my heart for all the wonderful compliments to my work that I have received in the last few days (and years) here on WordPress and on my Facebook page. Let your friends and family inspire you. You’ll be glad you did! Posted on December 10, 2016, in My Thoughts and tagged acrylic paintings, art, Chinese watercolor painting, Koi Fish, pencil, Sea turtles, Sumi-e: The Art of Japanese Ink Painting, watercolor painting. Bookmark the permalink. 10 Comments. I was lucky enough to live in London for a time and saw many works from Vincent and always went away wanting to paint. Songs, smells yes all bring wonderful memories. So happy we linked up on Facebook. I liked your FB page so I can see your art. Will follow blog too. Lovely to meet you. Kath ps Feel free to check out my blog space too. Wow Kath, you are blessed for sure! I would love to see any van Gogh painting in person! I am happy we met on Facebook as well. I am going to check out and follow your blog now, too! Thanks for following mine! I have not been doing as much art lately, but plan to soon. I have been busy too but after looking at your beautiful art I am inspired to paint. Thanks so much Kath! I am equally inspired by yours as well. However, I am doing antibiotics for an ear infection over the next week so hope to do something soon anyway. Get well soon I can never do art when I don’t feel well. Thanks Kath, I appreciate that. Yeah, I usually can’t either. I am actually feeling pretty well today. My ears don’t hurt anymore. I printed out your free book about your brother and my husband liked it also. It is moving and so thoughtful of you to do as a tribute to him. My husband’s dad committed suicide about 17 years ago also so we know that pain. Yes there are many who know that pain sadly enough, sorry to hear you and your husband have felt this kind of loss too. Happy that you liked my tribute to my brother Pat he was a pretty special brother. Good that you feel better Im hoping to sketch this afternoon but going shopping first and know that it frazzles me and kills the muse. Oh dear Sherri how I love you, too! Thanks for the link to “our” fox painting! Ha, ha….I feel like we are sharing it somehow. I am so glad it touched you so much and found a place to brighten up your home. It is funny that I experienced all of that during my pregnancy with my son, but nothing with my daughter! I was so relieved that everything went better the second time for sure! But our children are gifts from God, and I have always loved them being in my life.